Tumor histopathological response to neoadjuvant chemotherapy in childhood solid malignancies: is it still impressive? The management of oncological malignancies has significantly improved over the last decades. In modern medicine, new concepts and trends have emerged paving the way for the era of personalized and evidence-based strategies adapted to the patients’ prognostic variables and requirements. Several challenges do exist that are encountered during the management, including the difficulty to assess chemotherapy response with certainty. Having known that neoadjuvant chemotherapy might be the only solution for a proportion of patients with tumors that are unresectable at diagnosis, emergence of strategies that use risk group-directed therapy became an integral part in the management of oncological malignancies. Tumor histopathological change post neoadjuvant chemotherapy is one of the most important predictors of management outcome and is being used in many chemotherapy protocols as an essential determinant of the most suitable postoperative chemotherapy regimen. Bone tumors are the classic models of this approach; however, other childhood solid tumors show significant variations in outcome as a result of tumor histopathological response to neoadjuvant chemotherapy. The aim of this review is therefore to summarize the significance of histopathological responses seen after neoadjuvant chemotherapy in childhood solid tumors. Moreover, it suggests that the effect on tumor histopathology through modifying neoadjuvant chemotherapy and, on the other hand, toxicities from intensifying adjuvant chemotherapy might either necessitate the change of a number of arm groups in different protocol regimens or include newer chemotherapeutic agents adjuvantly for better outcome and lesser toxicities in poor tumor histopathological responders. Tumor necrosis and histopathological changes in childhood solid tumors following neoadjuvant chemotherapy are important predictors of disease outcome. 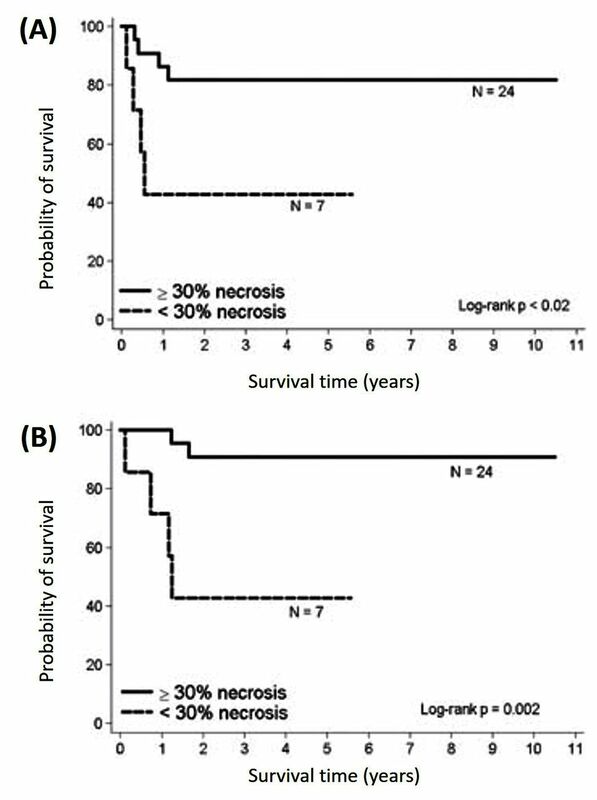 Survival rates are better in good responders to neoadjuvant chemotherapy with high tumor necrosis than those with poor response. Despite these facts, there is little evidence to recommend for more intensified adjuvant chemotherapy regimens for poor responders as no benefits are seen with regard to disease outcome when compared with historical counterparts. These can be seen clearly from results like in large osteosarcoma trials where ifosfamide and etoposide (IE) did not show a valid benefit when added adjuvantly to high-risk patients and in Wilms' tumor (WT) where doxorubicin can be safely removed from postoperative chemotherapy in intermediate-risk patients; even the results have to be validated in Ewing’s sarcoma (ES) despite the promising results in the busulfan/melphalan arm in poor responders. 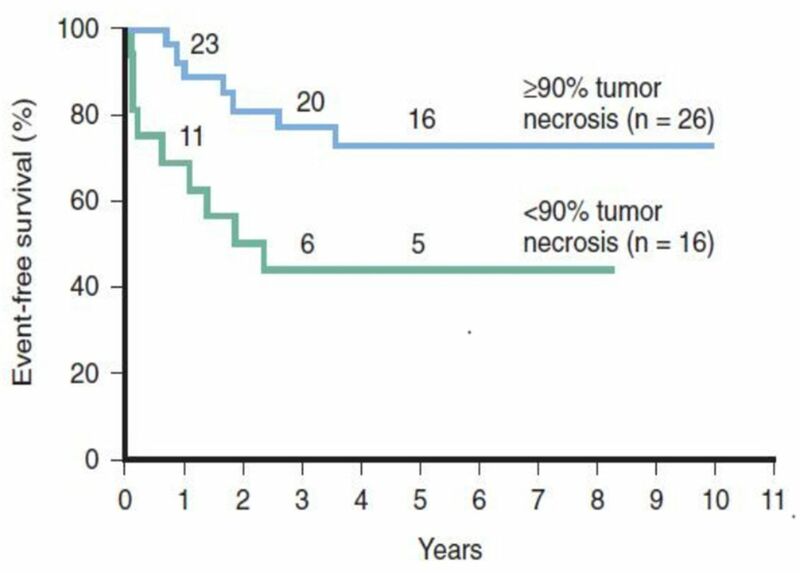 Good responders are those who have tumor necrosis of more than 90% corresponding to grades III and IV, whereas poor responders are those who have tumor necrosis of less than 90% corresponding to grades I and II.9 10 The disease-free survival rates are 50% and 80%, respectively (figure 1), (table 2). Different osteosarcoma protocols have used the poor response to neoadjuvant chemotherapy as a determinant of more intensified adjuvant chemotherapy. 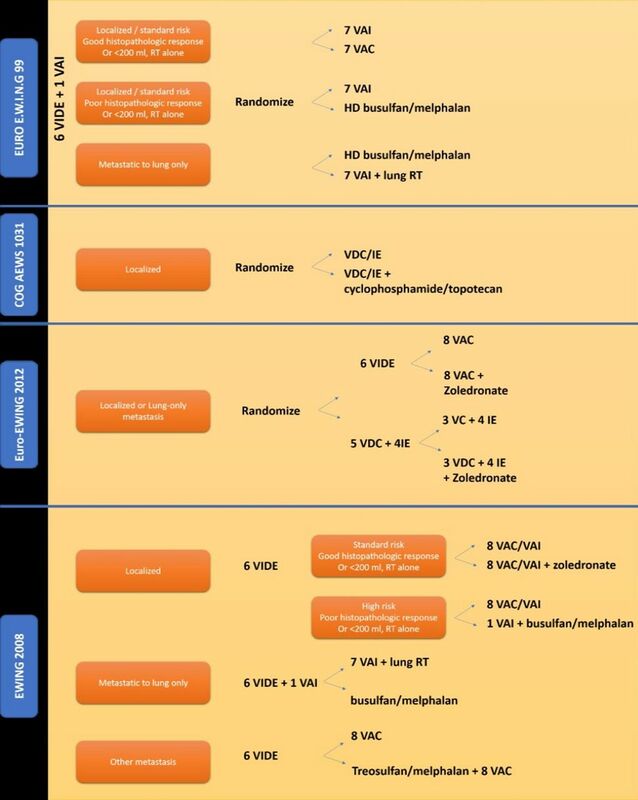 Protocols used by Children’s Cancer Group (COG), Rizzoli Institute, and German-Austrian-Swiss Cooperative Osteosarcoma Study Group (COSS) include neoadjuvant chemotherapy consisting of high-dose methotrexate (HDMTX) and bleomycin + cyclophosphamide + dactinomycin (BCD) and adjuvant chemotherapy was intensified with the addition of cisplatin (CP) and doxorubicin.11 12 Neoadjuvant treatment consisted of HDMTX, BCD, and doxorubicin in the MSKCC T10 protocol and CP was the drug used to intensify the adjuvant phase. Patients in the poor responder group had a similar outcome to those who did not receive augmented chemotherapy, in spite of chemotherapy intensification except in T10 protocol. Absolute difference in event-free survival by flexible parametric model difference. 95% CI is shown by shading.15 MAP, methotrexate, cisplatin, and doxorubicin; MAPIE, MAP plus ifosfamide and etoposide. 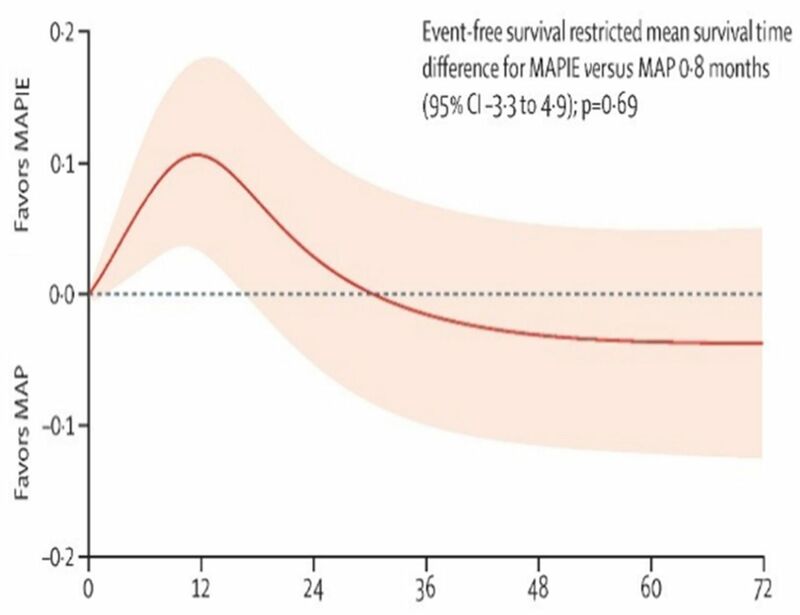 Event-free survival by non-metastatic osteosarcoma status and metastatic osteosarcoma status at registration.15 MAP, methotrexate, cisplatin, and doxorubicin; MAPIE, MAP plus ifosfamide and etoposide. 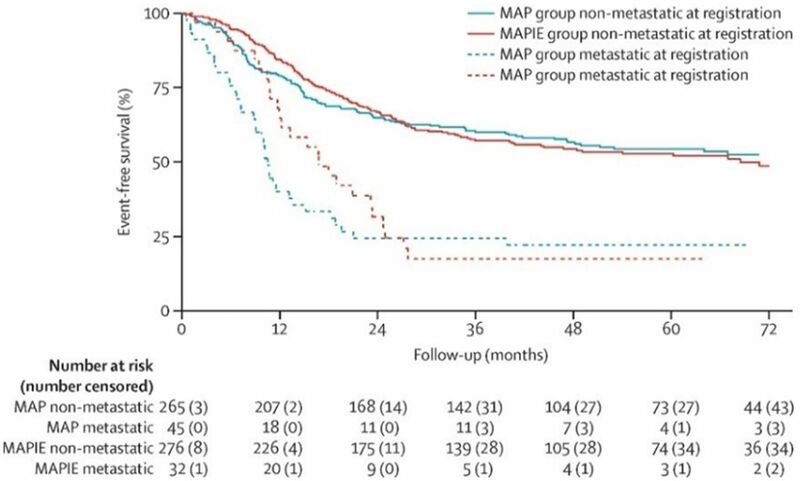 Overall survival in osteosarcoma.15 MAP, methotrexate, cisplatin, and doxorubicin; MAPIE, MAP plus ifosfamide and etoposide. All data considered, there seems to be no solid evidence that intensifying adjuvant chemotherapy for patients with osteosarcoma with poor histological response led to an improved outcome. In a meta-analysis of several trials, Smith et al demonstrated that an induction chemotherapy including doxorubicin with each cycle is superior to protocols alternating doxorubicin with actinomycin D.18 In European Intergroup Cooperative Ewing Sarcoma Study (EICESS 92), vincristine, dactinomycin, ifosfamide, doxorubicin (VAIA) and etoposide, vincristine, dactinomycin, ifosfamide, doxorubicin (EVAIA) for induction therapy achieved tumor response rates above those obtained with the VACA regimen in the CESS 81 study. All considered, a further increase of treatment intensity during the induction treatment, particularly during the time when the primary tumor is still in place, was considered an option of further improving both the histological response and the survival in patients with ES. Patients with >10% viable tumor cells at surgery following neoadjuvant therapy in CESS/EICESS studies had a less favorable outcome with an EFS of 0.47 after 10 years. Patients with good histological response (less than 10% viable tumor) after chemotherapy alone had a prognosis of about 0.70 after 10 years. In a combined analysis, data on patients treated surgically from the CESS/EICESS and the Société Francaise d’Oncologie Pédiatrique Ewing tumor (SFOP EW) studies demonstrated the impact of histological response was more prominent than the impact of tumor volume. By contrast, when radiation therapy is the initial local control, survival is independent of histological response. Based on data from ET-1, ET-2, EW88, EW93, CESS81, CESS 86, EICESS92, and other European studies, the Ewing tumour Working Initiative of National Groups (EURO EWING 99) (figure 6) stratified the patients according to metastatic profile, site of metastases in stage IV patients, feasibility of local therapy options and histological response to chemotherapy, and initial tumor volume of <200 mL /≥200 mL in patients where surgery is not feasible as primary local control. Having known that utilization of high-dose chemotherapy may be limited and only 45% of eligible patients with localized disease (216 of 477) and 55% of patients with pulmonary metastases (265 of 480) were enrolled on the trial, consideration regarding busulfan–melphalan as a part of standard care of high-risk patients should be further validated. 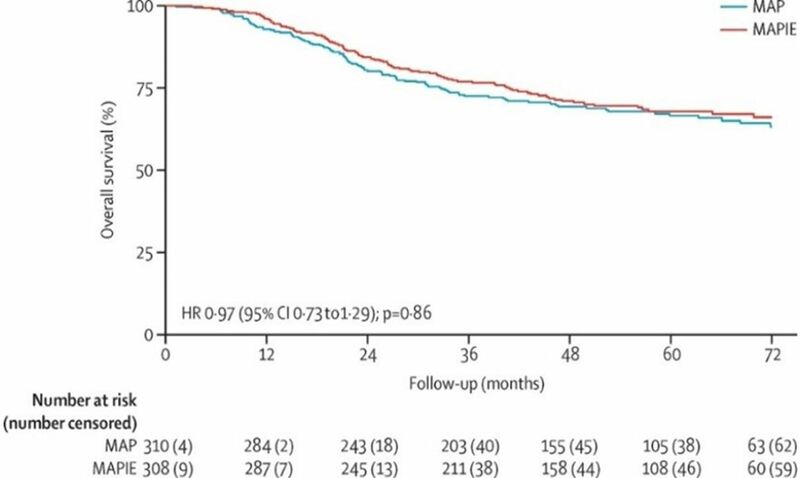 Taking these data into consideration, despite the application of tumor histopathological response to stratify treatment in ES in many protocols, we find no strong evidence that intensifying chemotherapy in poor responders results in better outcome or at least still needs further validation. Induction phase of chemotherapy in neuroblastoma is of a significant value. Ladenstein and colleagues performed analysis on 549 patients with high-risk neuroblastoma (NB) and confirmed that bone and bone marrow involvement were the only independent adverse prognostic factors.27 More recent retrospective studies have shown that metaiodobenzylguanidine (MIBG) response at the end of induction directly correlates with EFS after myeloablative therapy. Tumor necrosis and histological changes in tumor post neoadjuvant chemotherapy was not a part of any RMS protocol and have not been studied in this perspective despite some studies that described treatment-related changes that occurred in RMS. Some reports stated that surgical or pathological findings were always corresponding to the imaging appearance of RMS. Poor radiological response or residual large mass on CT scanning may not represent persistent viable tumor and might instead be due to reactive or reparative changes, cytodifferentiation, necrosis, inflammation, and fibrosis.37 38 Furthermore, post chemotherapy samples can show a spectrum of necrosis; inflammation with macrophages, lymphocytes, and plasma cells; fibrosis; and atrophic or regenerating non-neoplastic skeletal muscle. This area of study with regard to tumor changes in RMS post chemotherapy and a complete understanding of the clinical relevance of what the results could be necessitate further studies. Tumor necrosis and histopathological changes in childhood solid tumors following neoadjuvant chemotherapy are important predictors of disease outcome. There are better OS, EFS and even lower rate of local recurrence in good responders with high tumor necrosis. However, there is little evidence to recommend for more intensified adjuvant chemotherapy regimens for poor responders. Toxicities from intensified adjuvant chemotherapy and comparable disease outcome are among the main causes behind these results. Trends toward intensifying neoadjuvant chemotherapy for better histopathological responses or addition of newer chemotherapeutic agent to the adjuvant arm should be a subject to more large trials in order to use the beneficial value of tumor histopathological changes as an important predictor of disease outcome. We gratefully thank Dr Omar Al Zahrani, director of Prince Sultan Oncology Center for his support and continuous encouragement of research development at the center.
. Bone tumors: diagnosis, treatment, and prognosis. 2nd edition. Philadelphia, PA, USA: W.B. Saunders, 1990.
. Chemotherapy for malignant bone tumors. Orthop Clin North Am 1989;20:487–503. ; Nathan and Oski’s hematology and oncology of infancy and childhood. Eighth edition.
. Scandinavian Sarcoma Group Osteosarcoma Study SSG VIII: prognostic factors for outcome and the role of replacement salvage chemotherapy for poor histological responders. Eur J Cancer 2003;39:488–94.
. Ursodiol prophylaxis against hepatic complications of allogeneic bone marrow transplantation. A randomized, double-blind, placebo-controlled trial. Ann Intern Med 1998;128:975–81.
. Efficacy of busulfan-melphalan high dose chemotherapy consolidation (BuMel) in localized high-risk Ewing sarcoma (ES): Results of EURO-EWING 99-R2 randomized trial (EE99R2Loc). J Clin Oncol 2016;34. 43rd Congress of the International Society of Paediatric Oncology (SIOP) 2011. SIOP Abstracts. 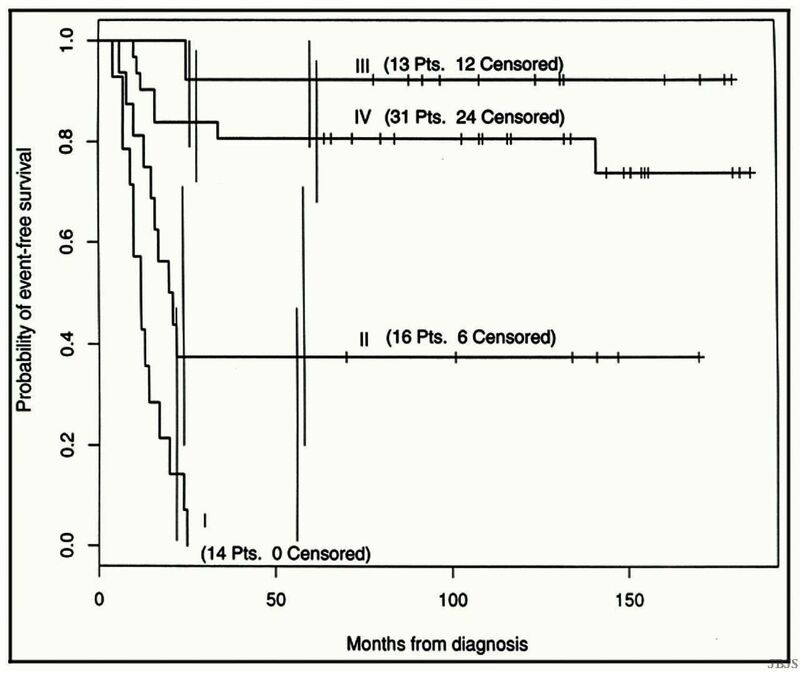 Pediatr blood cancer 2011. 57. Auckland,New Zealand, 2011:705–897.
. Chemotherapy effects on hepatoblastoma. A histological study. Am J Surg Pathol 1993;17:1266–71. Contributors EH wrote the article, reviewed it and completed all necessary requirements. AAJ and MAP have substantial contributions to conception and design, revising it critically for important intellectual content and final approval of the version to be published. AD, FN and GG have substantial contributions to conception and design, acquisition of the data and drafting the article. Correction notice This article has been corrected since it was published Online First. Figure 5 has been replaced with the correct figure.